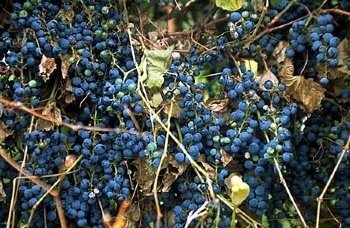 RIVERBANK GRAPE - A native grape which may climb to a height of 20 to 30 feet by means of tendrils. Can be grown on trees or fencerows for wildlife use. Fruit is small, purple blue in color when ripe, and sweet in taste. Utilized by many species of birds. Can be used in jellies and wine. Preferred habitat is woodlands, fencerows, and ravines. Native throughout the midwest U.S. "